SIV by Ray Hinchliffe. 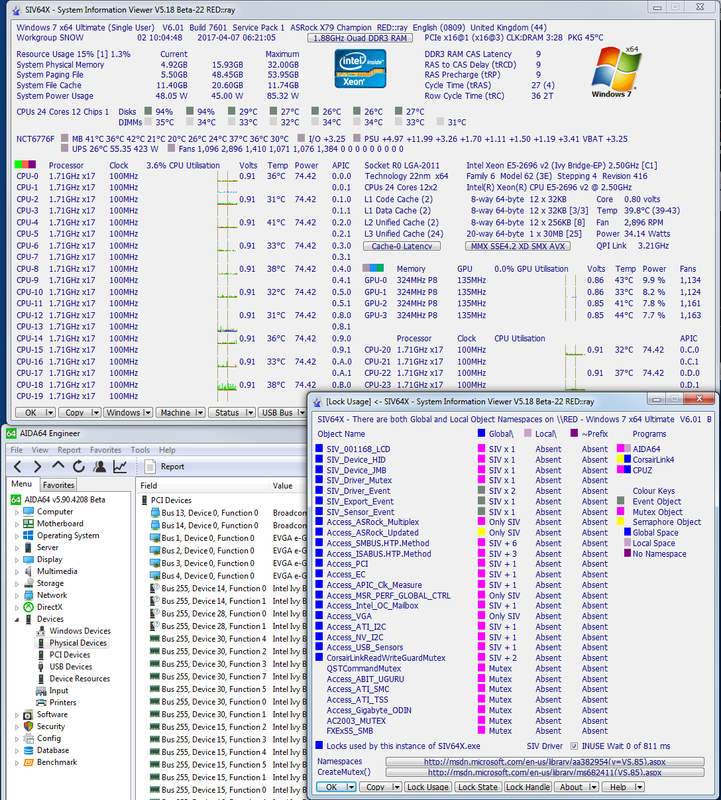 'System Information Viewer' is a general Windows utility for displaying lots of useful Windows, Network and hardware info - CPU info, PCI info, PCMCIA info, USB info SMBus info, SPD info, ACPI methods, Machine info, Hardware Sensors, Networked computers, Operating System Information and more. SIV is designed for Windows 10, 8.1, 8.0, 7, Vista, XP, 2016, 2012, 2008, 2003, 2000 and NT4. Windows 95, 98 and Me are also supported. Please download siv.zip from a mirror site FileCroco (official mirror), FileCluster, KubaDownload, MajorGeeks, OlderGeeks, Softpedia or TechSpot. 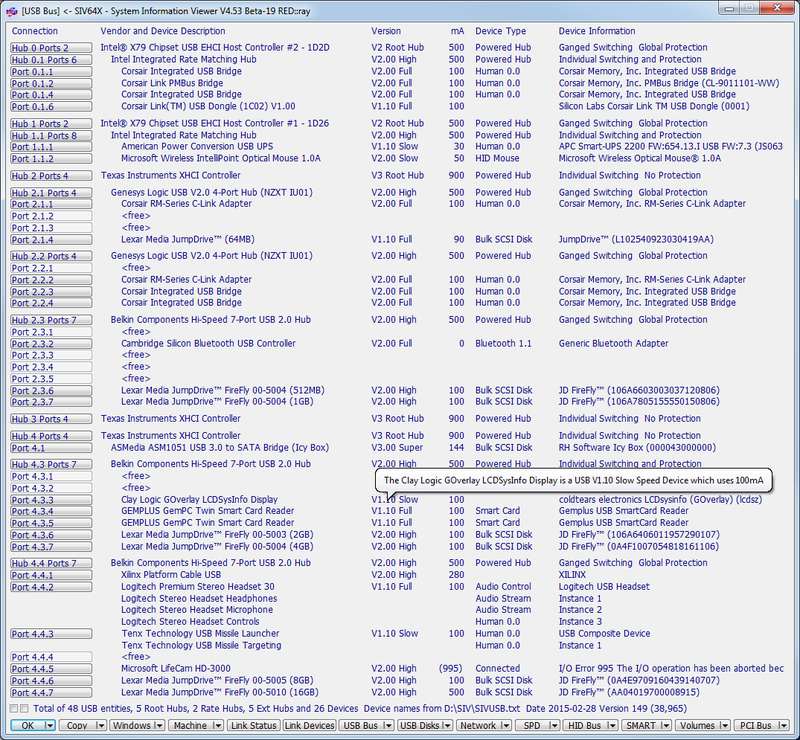 If you need a Windows WDM or WDF device driver I can develop it for you. Please e-mail me for further details. siv.zip SIV Unicode Release Kit for Windows XP and later systems. 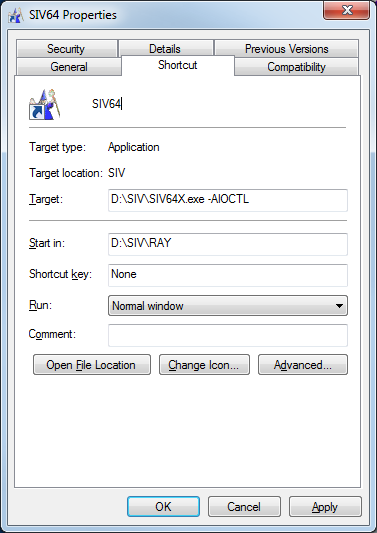 You should use SIV64X.exe on 64-bit Windows x64 and SIV32X.exe on 32-bit Windows x86. 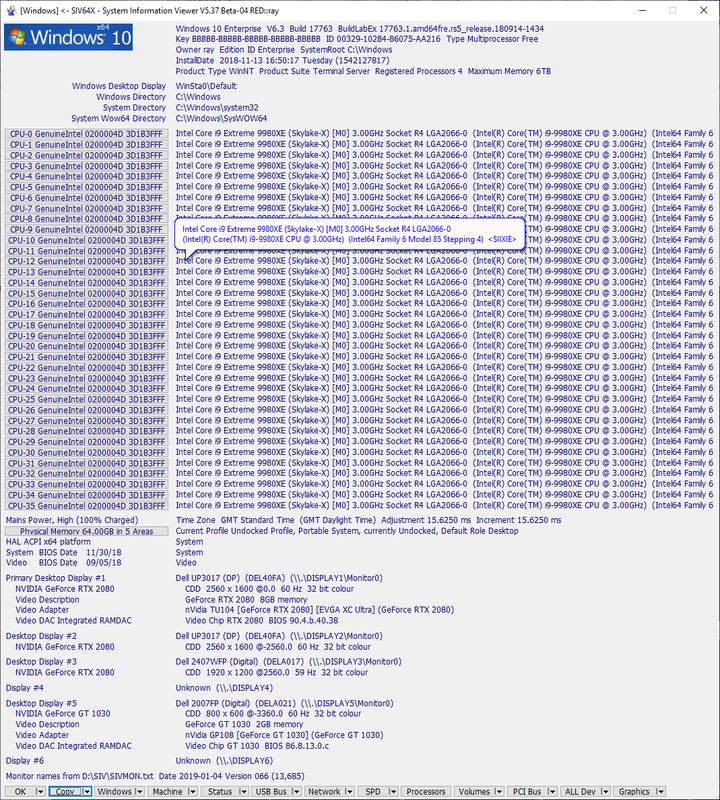 siv32l.zip 32-bit SIV ASCII add-on that is needed for the legacy Windows 2000, NT4 and 9X systems. SIV64I for Intel Itanium Enterprise Servers. Using SIV32X do Menu->File->Download->SIV64I add-on to get the native SIV64I.exe. SIV32A for DEC Alpha Servers/Workstations. Using SIV32X do Menu->File->Download->SIV32A add-on to get the native SIV32A.exe. SIV Beta Doing Menu->File->Download->SIV Beta will download the latest SIV Beta. The SIV Beta should not be mirrored as it changes frequently. 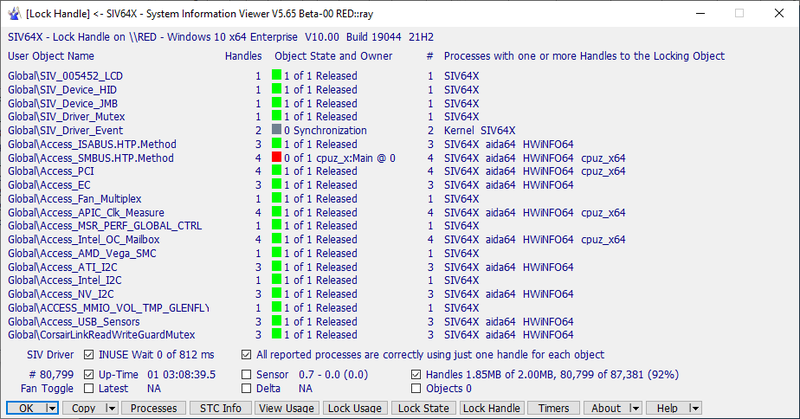 Note that siv.zip is always needed as it contains the device description files, SIV kernel drivers and the SIV resource DLL. The add-ons should be placed in the same folder as the files from siv.zip. 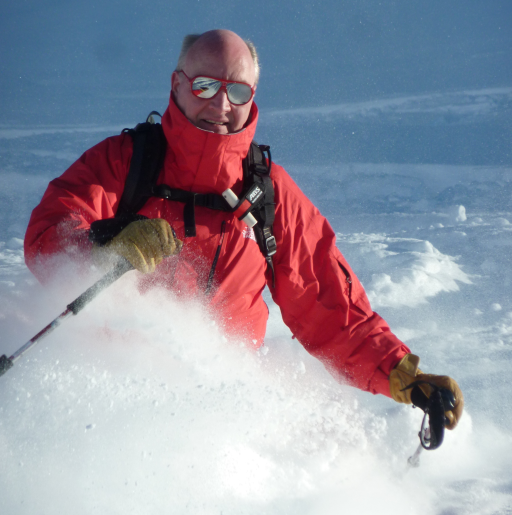 If you find SIV useful, please consider making a donation towards its development. SIV is free for home use but if you wish to use it commercially then contact me for further information. The SIV Support Forum provides help with using SIV and can also be used to report issues or request new features. For some issues a better option may be to e-mail the details along with the SIV save local (Menu->File->Save Local) files as this often means it's far easier to address issues. With most issues a SIV beta is usually released within a few days which resolves the issue or adds the new facility. 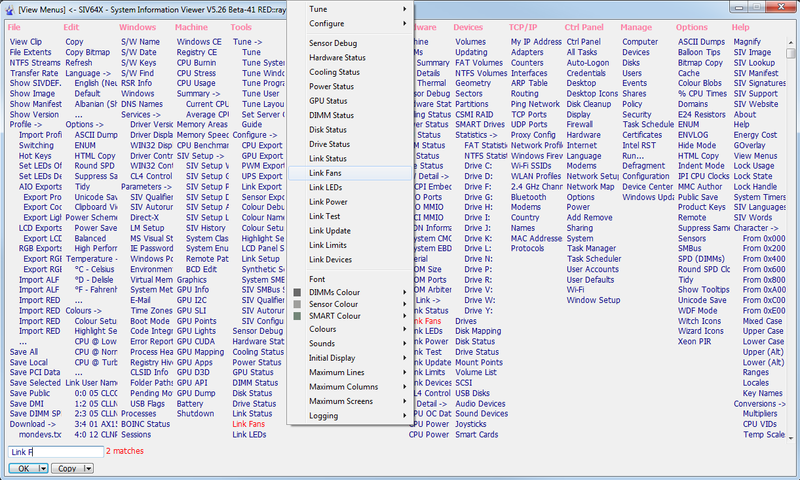 Before using SIV to control AIO Devices you should read the guide and in general this may be useful as it also contains sections about SIV setup and usage. 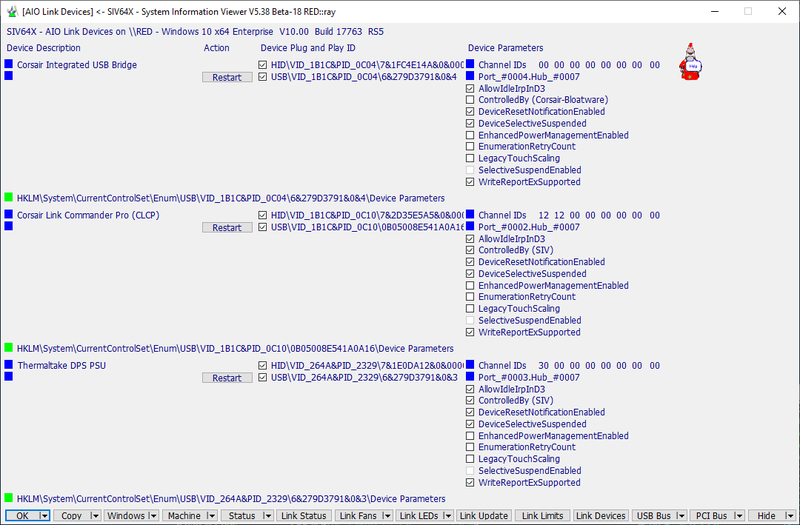 If [Link Devices] does not list your AIO Devices then check that they are Supported by SIV, listed on the [USB Bus] panel, have no I/O errors, they are reported by Devices and Printers, are in the Device Manager HID (Human Interface Device) or USB (Universal Serial Bus) sections and there are no errors (yellow triangles). Does a device come and go on unplug and re-plug the USB cable or SATA/Fan Header power connector? If you wish to use SIV to fully control your AIO Devices then you need to specify the -AIOCTL command line qualifier typically using a shortcut. When -AIOCTL is specified SIV will if needed automatically do the EnhancedPowerManagementEnabled registry change and restart the USB device. If you have any issues and need help then typically you need to provide screen images of the SIV Initial Screen, [USB Bus], [Link Devices], [Link Status], [Link Fans], [Link LEDs] and [Link Setup] panels. 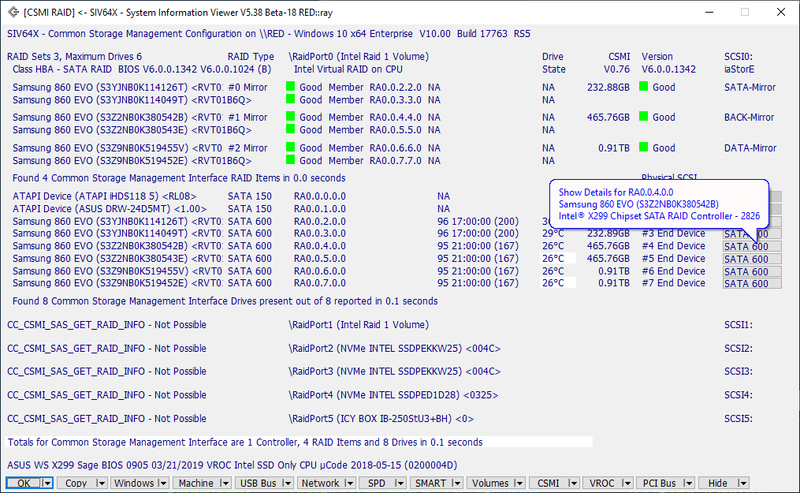 SIV stores the configured AIO hardware settings such as custom cooling curves in the Windows registry and you can use Menu->Machine->SIV Setup->SIV Setup AIO to view this. This configuration is setup in the hardware when you start SIV and specify -AIOCTL. For the [Link Fans] and [Link LEDs] pressing [Reset] will update the panel with this saved information and [Apply] will load the panel settings into the hardware. 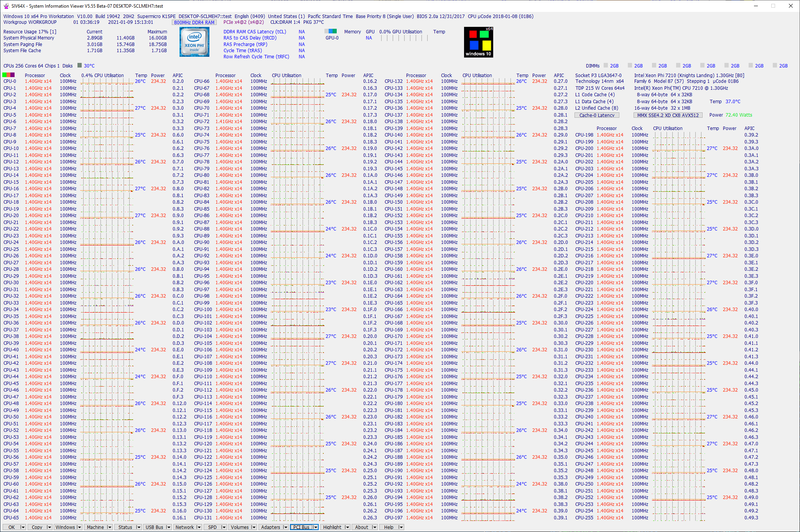 Should you wish to set all the fans to maximum speed select PWM, set 255 and then press [Apply]. To restore the saved setup press [Reset] then [Apply]. 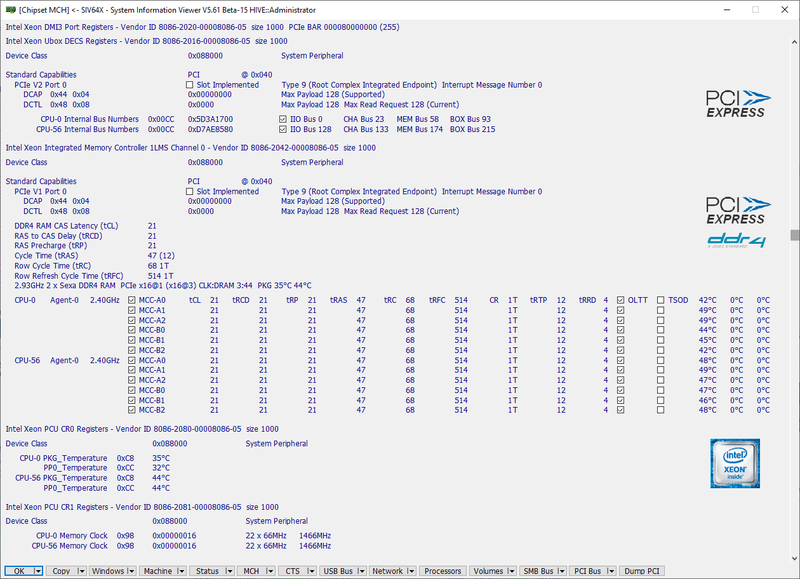 If either PWM or RPM as selected pressing [Save] is inappropriate, so it is greyed. The AIO Device reporting and control is only about 4% of SIV and finding the AIO Link panels can be tricky for new users. They are all accessed by the Tools sub-menu (Menu->Tools->Link ...) or via the [Status|▼] split button drop down menu. All the AIO Link panels have buttons to directly access others. When SIV does not find any AIO Devices only the [Link Devices] panel will be available. In the rare event of an application failure please keep a copy of the memory dump file in case this is needed. 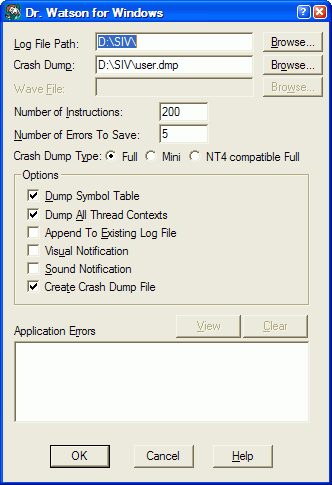 The memory dump is generated by either Windows Error Reporting (WER) on Windows 7/Vista/Server 2008 and later or by Dr Watson on earlier systems. Both of these will provide better information when the Symbol Tables (.PDB files) are available, these will be e-mailed to you on request. 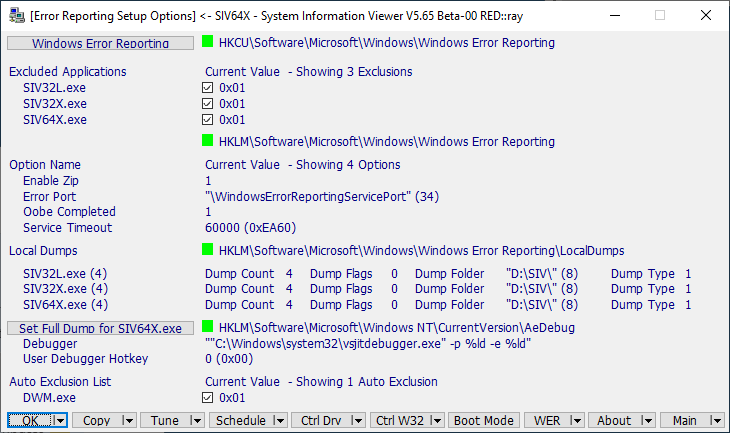 To configure WER to generate Local Dumps for SIV navigate to the Error Reporting Setup Options (Menu->Windows->Parameters->Error Reporting) panel and press the [Set Mini Dump for SIVXXX.exe] button. You should repeat this each SIV add-on that is used. Microsoft provide detailed information. 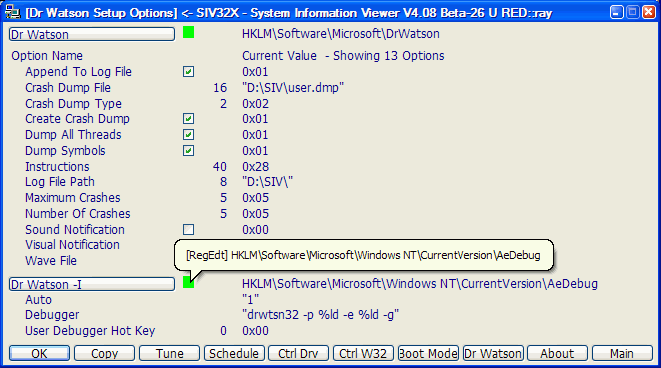 To setup Dr Watson dumps navigate to the Dr Watson Setup Options (Menu->Windows->Parameters->Dr Watson) panel, if the Debugger is not drwtsn32 -p %ld -e %ld -g press [Dr Watson -I] which will set this up, next press [Dr Watson] which will pop up the Microsoft Dr Watson for Windows panel which is used to configure the dump options and file locations. 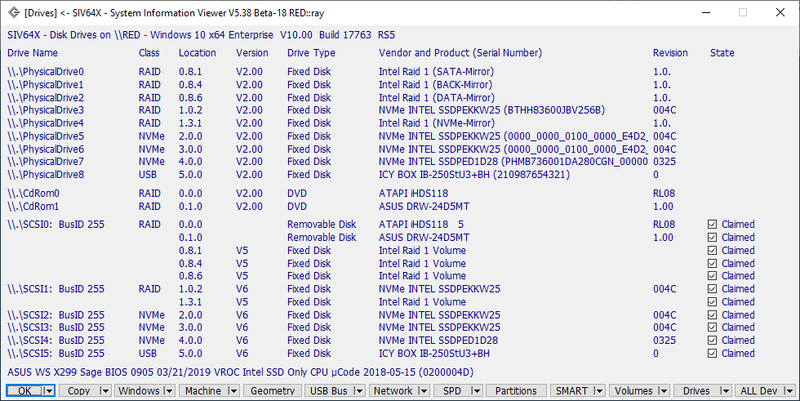 On some systems, notably Windows 7 with nVidia chipsets and several RAID controllers, the [SMART] panel may fail to report information. In many cases this issue can be resolved by using the -SCSI command line option. When this option is selected all requests to read the drive SMART information are routed via the SIV Kernel Driver which actions them using IRP_MJ_SCSI requests (hence -SCSI). Note that -SCSI is sticky, so you only need to specify it once and need to use -NOSCSI to stop the IRP_MJ_SCSI mode of operation. On some Dell systems when no Temperatures, Fan Speeds or Voltages are displayed specifying the -DELL command line option may resolve this. 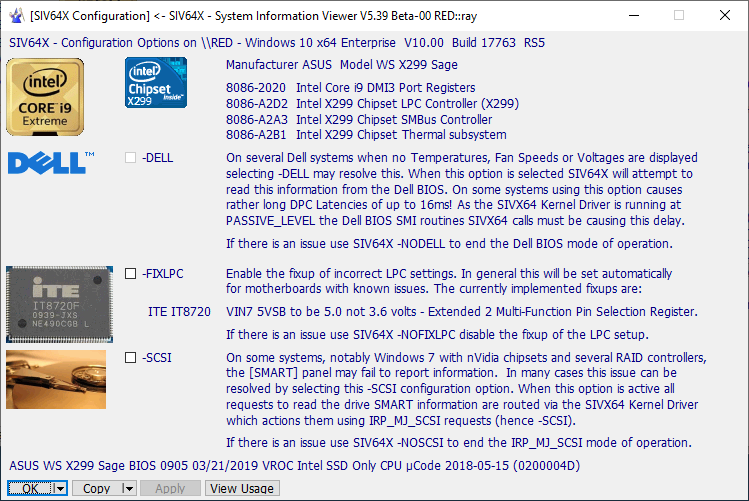 When this option is selected SIV will attempt to read this information from the Dell BIOS. 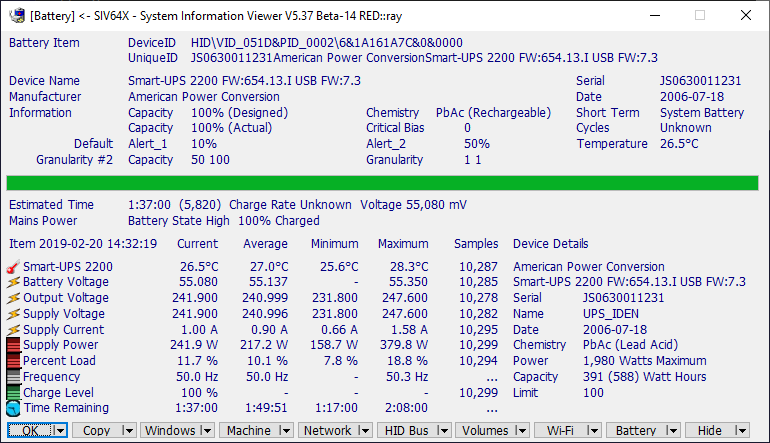 I use this option on my Dell 490 Workstation and Dell 1720 Laptop. Note that -DELL is sticky, so you only need to specify it once and need to use -NODELL to stop the Dell BIOS mode of operation. In addition to the command line options the SIV Configuration panel (Menu->Tools->Configure->SIV Configuration) which can be used to set the -SCSI and -DELL modes of operation. If programs are accessing the SMBus and either not using the locks at all or create them in the Local\ rather than the Global\ namespace the SMBus access will not work correctly. SIV detects when the Local\ namespace is being used and will switch to using it which will work when there is a single session. If there are multiple sessions then Global\ needs to be used. The [Lock Usage] page displays the namespace the locks are currently within and [Lock Handle] displays the programs using the locks. When Only SIV is reported this shows no other programs are using that lock, so if other programs are reporting motherboard sensors their access will not be interlocked with the SIV accesses so the strange and unexpected may occur. All of AIDA64 + CPUZ + HWiNFO + OHM + SpeedFan + SIV should correctly use these locks and work correctly when used concurrently. ASUS AI Suite does not use these locks so should not be used when SIV is being used and doing this is unsupported. 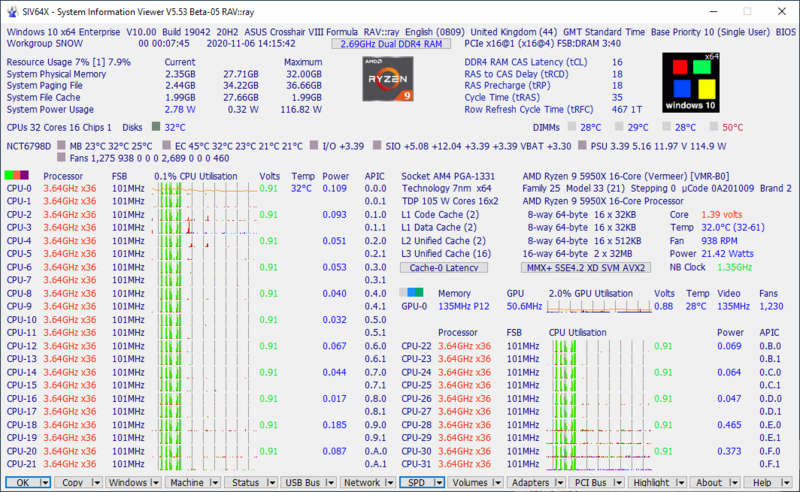 This is also the situation for most other motherboard manufacturer supplied utilities. 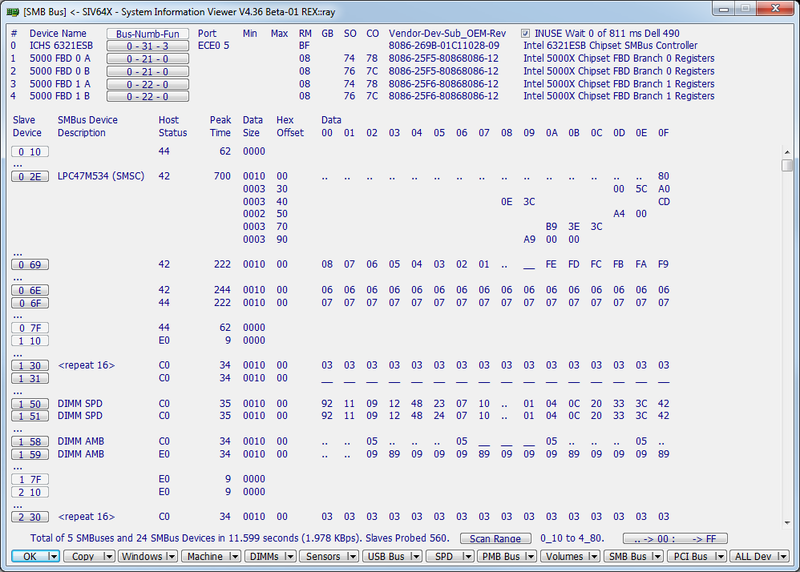 Some SMBus drivers interlock SMBus operations using the INUSE_STS semaphore. SIV also implements this regime as addition to using the Access_SMBUS.HTP.Method mutex. If you have any additions, corrections or need guidance in implementing locking then e-mail me. By default all SMBus slave addresses are scanned (0x10 <= slave < 0x80). If SIV detects as issue with accessing a slave device it will automatically add the address to the exclusion list along with the previous device which is often the cause of the issue. It is quite common for an access to slave 0x69 to lock the system, so this is by default excluded. If there is an SMBus lock up you may need to re-boot to get the SMBus working again. You can also use the [SMBus Setup] page to manually update slave address exclusions and/or update the SMBus Scan Range. If the SMBus scan causes a reboot or lockup then the command siv -dbgsmb -save=[initial][smb-bus][pmb-bus]=siv_dbgout.txt > siv_dbgout.log | more should be used to find and then report the issue. The last line of siv_dbgout.log will indicate the SMBus slave address causing the issue and once excluded then the issue should be resolved. When SIV, on the [SMB Bus] page, does not have a device description and you know what that chip is please e-mail the details so I can add it. If you have the datasheet for the chip please attach it. Currently SIV supports almost all Intel, most Ali, ATI, nVidia, SiS, and VIA SMBus controllers. If you have a system with an unsupported chipset, would like me to add support and are happy to test a SIV Beta then e-mail me the SIV save files (Menu->File->Save Local) from your system. If there is an issue with ACPI method evaluation (Menu->System->ACPI Eval) then the command siv -dbghal -save=[initial][acpi-hal][acpi-eval]=siv_dbgout.txt > siv_dbgout.log | more should be used to find and then report the ACPI method causing the issue. 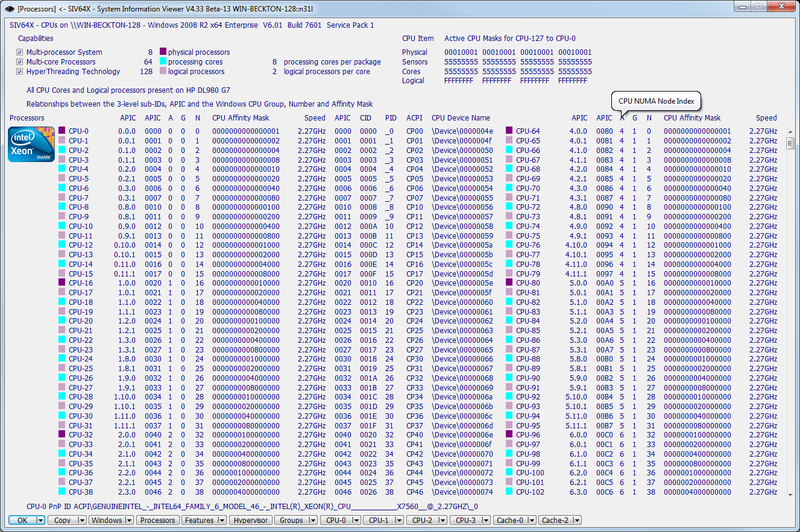 The last line of siv_dbgout.log will indicate the ACPI method that caused the issue.